Why everything about today rocked. So, today I met Cassandra Clare. I am absolutely not over it yet, I've been on cloud nine all evening and I had to just tell someone. I love meeting authors, going to book events and all that jazz, but when it's an author I really admire...well, I get so excited I almost burst...and that is sort of how today went. 1. My hair stayed in Cybelle ringlets all day and didn't even fall out (a small victory, but a victory nonetheless). I got to wear my Cybelle dress once more, and I am very flattered how many compliments I received on it! Ahh, all that swearing at the godawful satin being swallowed by my sewing machine was not in vain! 2. I got to spend the day with my wonderful other half who shares my love for the Shadowhunters series. 3. 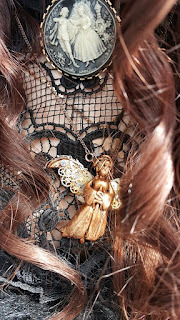 At my third attempt, I have made a hand sculpted replica of Tessa's clockwork angel necklace from the Infernal Devices. Tessa's clockwork angel with real pocketwatch parts. Third time lucky! 4. 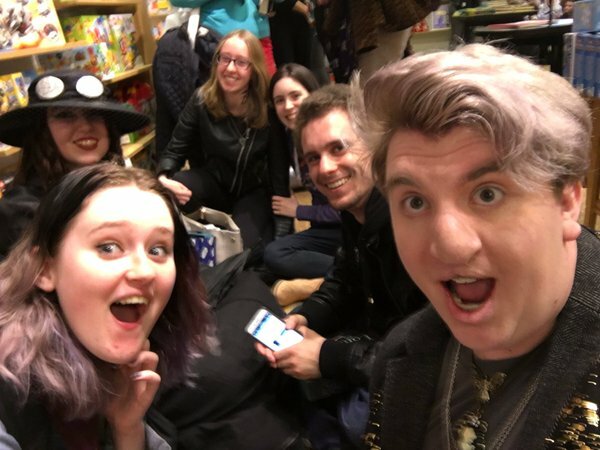 We got in line outside Waterstones in Birmingham in the early afternoon. I was buzzing and gradually became increasingly excited, clutching a shiny new copy of the Shadowhunter's Codex, and of course, Lady Midnight, while happily reading Clockwork Angel. Well, we turned out to be standing in line with a bunch of the loveliest people I have ever met at an event! I made a group of new friends today, all from different places, different backgrounds, but united by our love for the books. Honestly, the hours and hours we waited in line and I barely noticed the time go! We talked for ages about books, about Shadowhunters, planned cosplays and how fabulous we all agree Magnus Bane is. It was amazing meeting everyone today and I hope we can all stay in touch, I'm honoured to have met such a great group of fellow Shadowhunters! 5. Well the time finally came. I met Cassandra Clare herself. I must have looked utterly starstruck in hindsight. She's really lovely though! She complimented my outfit and and everything, even said I looked like Tessa or a Victorian Shadowhunter. Despite the lack of time and the 800+ people who turned up (I know!! 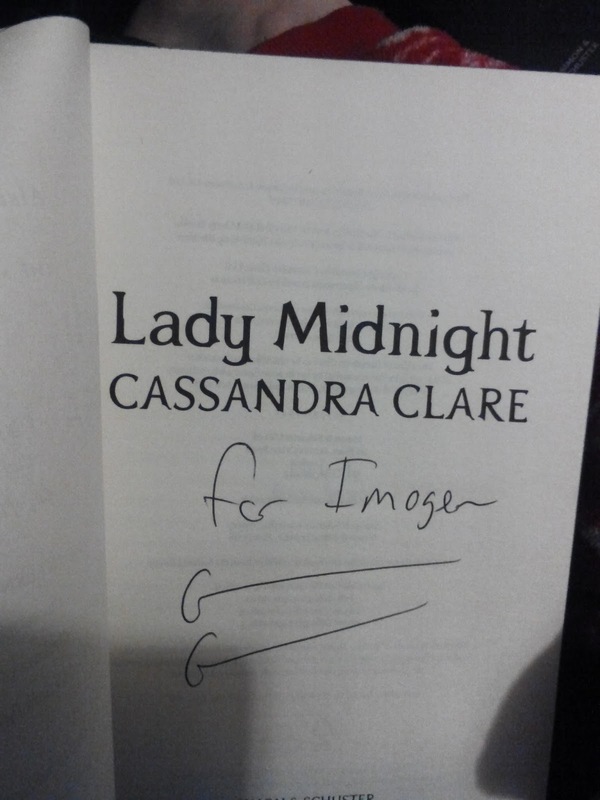 ), we got to talk for a couple of minutes and I am now the proud owner of a signed copy of Lady Midnight. I actually have even more respect for her, the way she makes time to talk to her fans and volunteered to stay after time to make sure everyone got their books. And, of course, it is incredible to meet the lady behind a book series and world that I absolutely adore. A new treasure for my collection. I think I shall be in my element for at least the next two weeks. But I am feeling newly inspired, which is exactly what I needed! I do believe my writers block has been cured and my motivation restored.